With changing consumer behaviour and preferences over past few years, the retailers are finding it a bit challenging to keep up with the demands and expectations of shoppers in 2018. Each retailer is vying with the others to provide the best shopping experience to their customers. In times like these, mobile apps have become one of the most efficient and trusted sources that can bridge the chasm between the brand and the customers. As per stats, More than 80% of mobile minutes in all markets are spent in apps. The average conversion rate from smartphones has risen to 64% which means not having a mobile app for your business can cost you dearly. Shoppers have completely changed the way they engage with brands nowadays. With 71% of those who have used retail apps said that they enjoy shopping using mobile apps, many retail brands are making that shift from online stores to mobile apps. However, despite the ever-growing number of retail apps, it has become quite difficult to make your retail app stand out and keep impressing the users constantly. That is the reason why not all brands have hit the success mark with their retail apps. So what is the recipe for a perfect retail app? Let us dive into it a bit more. Why To Build An App For Your Retail Business? It has been observed time and again that consumers prefer mobile apps as they are convenient, fast, and personalized. Thus, mobile apps essentially improve the customer experience and help you boost your sales. Those who believe in the long haul will pretty much understand the importance of earning customer loyalty. Apps keep customers stay active with your brand, and a good app will always offer them rewards that will make them keep coming back for more. Take Starbucks application for an instance. It provides the reward feature of tracking the stars and then redeeming them to buy free food or drinks. It also showers custom offers to Starbucks Rewards Members. The reward and loyalty programs in your app can make the customer feel valuable and special, even if it is a mere 15-20% discount. The bond that is created between your brand and the customer through these programs increases the customer retention. An app has always been a platform where the customers can interact more with the brand. Cosmetic mavens Sephora do this beautifully by providing a virtual artist feature in their app wherein you can digitally try makeup and see how it looks on your face. 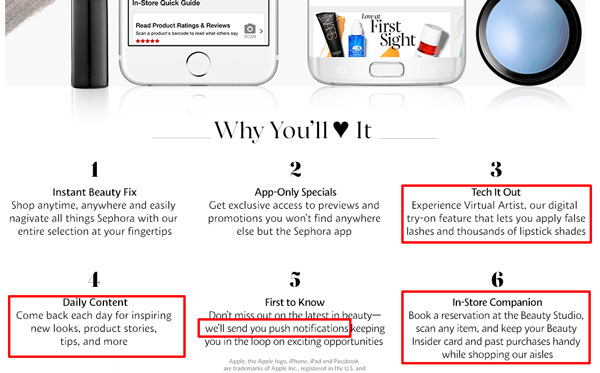 Not only this, there are many other valuable experiences that they use in their app to hook the customers. Thus, having an app will ensure that your customers are kept engaged at all times and remain attached to your brand. If you’ve arrived at this section of the article, I am sure you are convinced that retail apps do hold some weight. Apart from the core features that retail apps usually have that is deals, analytics, push notifications, loyalty programs etc. there are some features that’ll give your brand an edge over your competitors. Here are some of the most sought-after features a retail app must have in order to cross that benchmark with its’ users. Allow your customers to check prices of your products and compare them with each other and arrive at some decision. Keeping app users informed about the items that are available for purchase and their numbers. Also inform them about the items that are sold and the date of availability. Provide a comprehensive product information. It means leave no detail untold. The more lengthy the information, the more trust it will gain. The power of customer review is incredible when it comes to online purchase. So don’t forget to include customers reviews and related news about the product. Apps like Amazon and Walmart have set high standards for mobile apps and customers have become used to this kind of platform. If you already have an online store, now is a good time to integrate it with your eCommerce mobile app. Make the most of the latest tech trends such as AR and VR to enhance your user experience. Give the option of viewing your product in 3D to give wow factor. Engage all their senses at once. This can be used for both outside and inside of your store. Use this feature for intimating customers about the fresh arrivals, deals and offers as they walk past your store. For inside the store, you can provide them with a map of all the products that are placed inside your store. This is the most important feature in terms of brand recognition. Benefit from referral traffic by allowing your customers to share your app on social media platforms. Payment gateways make the process of online payments hassle-free and quick. Integrate these frameworks to facilitate in-app payment. This feature will enable your app to capture, store and process payment information and transactions. After understanding the features and benefits of having your retail app, the next logical step is getting it developed. Depending upon your budget, you can either choose freelancers or an app development company. Be aware of the pros and cons of choosing either of them. I would suggest you to prepare a detailed analysis before shortlisting between the two and go with the one that fits your business requirements the most. All this may sound a bit overwhelming but you can always start with baby steps. Choose the most basic features first before going all in with the fancy ones. Observe how your target audience responds and then tweak accordingly. Once you’ve set that pace, then there is no turning back! Author: Uzair is the VP, Sales & Marketing at Enterprise Monkey; an Australia based website and app development company which helps Small-to-Medium Enterprises, Large Enterprises and Startups increase their productivity and profitability. Uzair possesses a comprehensive experience in B2B and B2C marketing. Pursuing his vision to help Small and Medium Enterprises, he has successfully helped many such organisations increase their revenue and efficiency.